Following the great success of the 19th Congress of the International Commission for Optics (ICO) in Florence, Italy, the 20th Congress of ICO will be held in Changchun, at the Institute of Optics, Fine Mechanics and Physics, a famous center in China. ICO-20 will feature the latest scientific and technical developments in all areas of optics. The scope of the congress includes all areas of innovative optics to be developed in the 21st century. Optical scientists, engineers and optical industrialists from more than 40 countries are expected to meet together in Changchun. Changchun is an emerging industrialized city, located North-Eastern Beijing at the Jilin province (part of what used to be known as Manchuria). Very recently a cluster has been formed, the Changchun China Optical Valley. The aim of the organizers is to provide a unique forum in the field of optical sciences to all participants including related companies exhibition. The attendees will have an opportunity to meet experts and engineers challenging optical frontiers. All colleagues are invited to submit papers in their own field no later than January 15, 2005. All the accepted papers -including oral and posters- will be published in the Proceedings of ICO-20, and SPIE' s proceedings that are indexed in EI, INSPEC, ISI, AIAA and other leading scientific indexes. The organizers of ICO-20 will be very glad to meet a major representation of optics world in this general conference, emphasizing the theme that is the lemma: "Challenging Optics in Science & Technology". 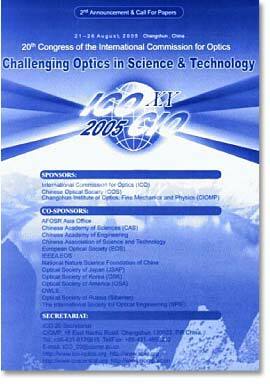 Topics include: Optical devices and instruments, optical communication, biomedical optics, optical information processing, lasers and laser technologies, material science and nanotechnologies, display devices and systems, remote sensing and IR devices and systems, MEMS and MOEMS, illumination, radiation and color technologies, optical design and fabrication and many others, representing a complete overview of the most active and relevant optics and photonics fields. 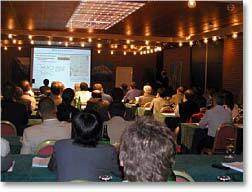 At the occasion of the ICO-20 , a satellite meeting is being organized as well: The 5th International Workshop on Adaptive Optics for Industry and Medicine, August 29 - September 2, 2005. This meeting will be held in Beijing. Complete details for preparation of manuscripts and other related information can be found at the official web site of the congress. A view of one of the sessions of EOS Topical meeting "Optics in Computing" held at Engelberg (Switzerland), a touristical city at the Nidwalden canton. Program: The scope of the meeting was to deal with the fundamentals of information optics and its applications in processing, storage, and data communications. The goal was to give a comprehensive overview of all relevant areas, i.e. ranging from material research via devices to applications. The purpose of the conference was to provide a platform for relatively mature areas (multi-dimensional imaging and sensing, interconnection and switching, for example) as well as to feature new trends in relevant areas such as micro- and nano-optics, biophotonics, Tera-Hertz optics, novel schemes for logic and architectures, etc. The meeting was organized in 12 sessions (including one poster session). The sessions and invited/plenary speakers were: Optics in Electronic Computers: D. A. B. Miller, Stanford Univ., USA; Materials and Devices: H. Heidrich, FhG-HHI, Germany; Photonic Crystals: M. Salt, Univ. of Neuchâtel, Switzerland; Correlation and Encryption: B. Javidi et al., Univ. of Connecticut, USA; Temporal Processing: Y. Fainman, UCSD, USA; Interconnection Systems: F. Kiamilev, Univ. of Delaware, USA and J. Yamaguchi, NTT, Japan; Computer Architectures: T. Pinkston, USC, USA; Packaging: U. Teubner, IMM, Germany; Optical Storage: B. Bechevet, LETI, France; Waveguide Interconnection: L. Dellmann, IBM Zürich, Switzerland; Future of Computing: P. Lukowicz, ETH-Zürich, Switzerland. The total number of papers was: 12 invited/plenary (see above); 54 contributed papers: 37 oral and 17 posters; 5 papers were withdrawn; Attendees: Total: 94 attendees (no-shows and cancellations excluded): full-time lecturer: 39, full-time member: 8, full-time non member: 7, students & emeriti: 14, invited speakers: 11, one-day reg. : 4, one-day reg. for lecturers: 11. Attendees in terms of country of origin: Belgium: 1, Denmark: 1, Germany: 18, France: 3, UK: 10, Ireland: 1, Israel: 1, Italy: 3, Japan: 16, Canada: 1, Austria: 1, Switzerland: 19, Spain: 4, Taiwan: 5, USA: 9, (one attendee did not give his country of origin). ICO Grant: Three participants from Belarus and Russia were offered travel support based on an ICO grant, however, two of them decided not to attend anyways. So, only a small part of that support money could be spent. Exact numbers will be made available by the EOS office (Klaus Nowitzki). Program Committee and Steering Committee: Two meetings were held apart from the regular sessions: the OiC Steering Committee (René Dändliker, Maria Yzuel and myself) and the Program Committee (about 15 participants). Several issues were brought up: the name change to "Information Photonics" for the conference series was supported by both groups. However, it was suggested to keep explicitly the name "Optics in Computing" as one of the main topics for the sake of recognizability. Furthermore, it was suggested to include IEEE/LEOS in the regular organization of the meeting. As to the next ICO sponsored meeting, there have been several suggestions to hold OiC 2006 meeting and in forthcoming dates this information will be announced on due time. Finally, I would like to thank for the ICO support, the excellent EOS organization (thanks to K. Nowitzki and his staff) as well as the support of the other organizations. Jürgen Jahns, Chair of de meeting. Hagen, 12 May 2004. Symbol of the modern world, the laser takes a room of choice in today's technological progress and that of tomorrow. 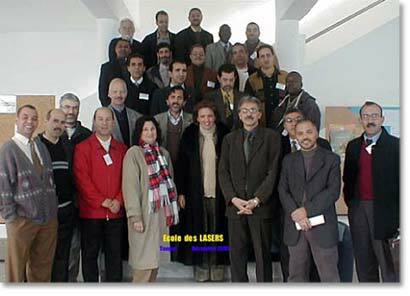 The Moroccan Society of Optics (SMOP) has organized, from the 15th to the 19th of December 2003, a School on Lasers and their applications in National School of Applied Sciences of Tangier. It comprises a series of interventions by experts in the field. Some of the participants of the School of Lasers, held at the National School of Applied Sciences, Faculty of Sciences and Technologies, University of Abdelmalek Essaadi, Tangier, Morocco. Prof. René Dandliker, President of ICO, treated principles of laser basis, whereas Prof. Maria Calvo, General Secretary of ICO, landed the problem of coherence of the laser beam. Prof. Jean Paul Pocholle (Thales, Paris) made dawns it on the state of art of realization and utilization of lasers. Prof. Remy Fabbro recalled possibilities, while presenting samples, of the utilization of the laser for the treatment, the carving or weldering of materials. The environment field has been treated by Prof. Taieb Gasmi (Faculty of Science and Engineering, University Saint-Louis of Madrid, Spain) and Jérôme Kasparian (LASIM, Lyon, France). They provided the aid for the utilization of the ultra fast lasers to detect the atmospheric pollution and to trigger and guide discharges. One session per day has been dedicated to the application of lasers in the medical diagnosis. The intervention of Prof. Sigrid Avrillier (LPL, University Paris-XIII), pioneer of the laser medical diagnosis in France, concerned the cellular oxymetry while studying the oxygenation of cloths by measuring the evolution of the absorption of red or infrared light by hemoglobin, (only constituent to absorb the infrared laser light). She also described the utilization of the laser in the precocious detection of tooth caries. The group of Prof. Ahmadou Wagué (University Cheik Anta Diop, Dakar, Senegal) in collaboration with a Swedish laboratory at the Lund University Hospital, uses the laser in the detection and the destruction of the cancerous cells of skin. In addition to seminars, participants could get some benefit from the laser presentations: Nitrogen laser for the pumping of Dye lasers by Jérôme Kasparian, the Optical fiber laser by Prof. Aziz Boukentar (LTSI, Saint - Etienne, France), a kit of optics with Helium-Neon laser by Prof. Yehia A. Badr (NILES, Cairo, Egypt). The workshop included communications made by specialists from the Maghreb, Egypt and Senegal. In the same way some conferences have been presented to the benefit of students of the University Abdelmalek Essaadi of Tangier. The workshop was sponsored by ICTP, ICO, ISESCO, CNRST-Rabat, University Abdelmalek Essaadi and Embassy of France in Rabat. The United States Advisory Committee to the International Commission for Optics (USAC-ICO) is offering among its activities the program for Traveling Lecturer. This year, and inside this program, Dr. Barry R. Masters, a Fellow of OSA and SPIE, and consultant in Arlington, Va., has developed an intensive program of visits to various institutions and research centers in India. Dr. Masters has visited and delivered lecturers and seminars to the following centers: 1.- Indian Institute of Technology, Delhi, under the host of Profs. Rajpal S. Sirohi, director, and Kehar Singh. 2.- J.C. Bose Institute in Calcutta, with in addition a visit to the Bose Museum in which the responsible person is Dibakar Sen. 3.- Indian Institute of Technology in Kharagpur. 4.- Indian Institute of Technology in Bombay hosted by the head of the physics department S.S. Major and including a visit to the laboratories for fiber optic sensors led by Gargi Vishnoi. 5.- Center for Cell and Molecular Biology (CCMB), National Center for Confocal Scanning Fluorescence Microscopy and the L.V. Prasad Eye Institute in Hyderabad under the support of Lalji Singh, director of the center. 6.- Raman Research Institute, Indian Institute of Science, National Center for Biological Sciences in Bangalore and including a meeting, in that occasion with R.M. Vasu, chair of the department of instrumentation. 7.- And finally, a visit to Chennai, Madras, the Indian Institute of Technology, hosted by Prem B. Bisht and the Vision Research Foundation, Sankara Nethralaya The Elite School of Optometry. In this last center he was following the visit organized by S. Srinivasan, principal of the school. The subjects of the lecturers and seminars delivered by Barry Masters in the mentioned centers were quite abroad, from non linear microscopy to biomedical optics and from particular to general overviews in non linear optics research projects for graduate students. The grant offered by the USAC-ICO Committee for this Traveling Lecturer Program was supported by OSA. A complete report of this traveling lecturer has been published in Optics and Photonics News (May 2004) and it is available on-line at USAC-ICO Activities. In the addition to the above mentioned visits, the USAC-ICO Committee has developed the following programs: Jagdish Singh visited India in September- December 2004. Abhay Sharma visited India in August 2004. Sergey Ulyanov visited China in March 2003 with a grant offered by the US National Research Council (NRC). John Ballato visited Moldova in November 2003 with the support of US NRC. And finally Charles Joenathan visited Argentina in November 2003. News of ICO Territorial Committees are welcome to be regularly edited in this section. The territories can profit of ICO NL wide distribution for free publication of their professional, academic and research activities.